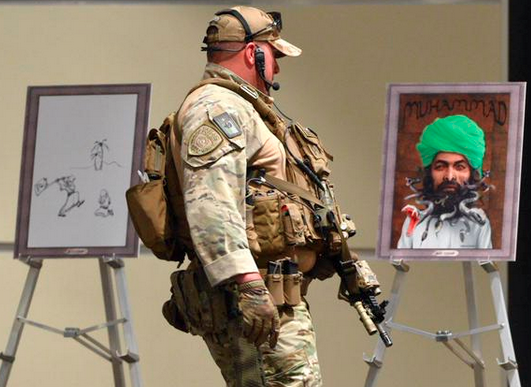 Yesterday, two Muslim extremists armed with guns shot at, and tried to enter, a Muhammad cartoon competition located in the Dallas area, Curtis Caldwell Center. Fortunately, the organizers of the event had hired significant amounts of extra security (one report estimated $10,000 worth of off-duty police to supplement the normal security measures), who shot and killed these terrorists before they could enter the building. One security guard from the Curtis Caldwell center was shot in the leg and his injuries are not life-threatening. This shooting is just the most recent in a long pattern of Muslim extremists attempting to murder people who they see as offensive to their religion or its prophet. If the police had not been there to stop these men, there is little doubt that this would have been a repeat of the Charlie Hebdo shooting. The event that that was attacked was put on by Pamela Geller’s American Freedom Defense Initiative. While the name of this group sounds positive, the fact is that Pamela Geller is a right wing ideologue and her group is little more than a neoconservative idea mill that produces bad foreign policy ideas and nationalist propaganda. Her group was running a draw Muhammad contest that would award $10,000 to the cartoonist who drew the “best” cartoon. Ostensibly, her event was intended to promote free speech and fight back against Muslim anti-speech violence, but it is very likely that she was just trying to antagonize people and raise donations from right wing supporters. That said, her motives, methods, and ideological background are completely and totally irrelevant to this situation. In the USA, everybody has the right to be a bigot or idiot, and nobody has the right to harm people who they disagree with. Geller was well within her rights to sponsor an event that lampoons Islam, and Muslims have every right to be offended and insult her back. The terrible irony of this situation is that the attackers and many in the media covering the attack have done everything possible to prove Geller’s anti-Muslim message for her. First, two Muslim extremists went to a peaceful (if offensive to some) cartoon exhibition with the intent to murder cartoonists for insulting them. These two individuals are real-life manifestation of the barbaric, violent, theocratic, caricature that has been applied to Muslims throughout the west. It is simply impossible to call Islam a religion of peace while lunatics like this are committing such violence across multiple continents. Second, many people in the media have reacted in a way that suggests that the natural and expected response to drawing Muhammad was that violent Muslims would try to murder you—oftentimes, these are even the same people who claim to hate Geller for being an “Islamophobe” or a hate-monger. They blame these cartoonists and Geller’s group for “inciting” the attack and say that it was wrong of them to use their right to free speech in the way that they did. They argue that the intended-victims are somehow to blame for the violence that was almost perpetrated against them. Put simply, these people are demonstrating true bigotry by infantilizing Muslims and inadvertently buying into the argument that Muslims are just so savage, extreme, and uncontrolled that society cannot hold them to the standard that we hold everybody else. They claim the mantle of “religious tolerance” while they really present a case for anti-Muslim condescension. By holding society to a different standard in regard to insulting Muslims, these people are willing to justify denying American’s their rights and pandering to religious extremists. Their proposed sensitivity is wholly limited to Muslims, and if Mormon extremists had bombed a showing of “The Book of Mormon,” none of the individuals would ever make these excuses. This is simply because they have internalized the ugly stereotype of Muslims that they purport to reject (unconscious bias) but are trying to make a visible effort at overcompensating in the other direction (extreme political correctness). The only non-racist way of looking at this situation is to hold EVERYBODY to the exact same standards. No group should be assumed inferior or less able to control themselves in the face of criticism and no line of discourse should be seen as so offensive that it requires a response with a gun. In a world that follows this ideal, anybody is allowed to insult any religious group—whether it is Islam, Judaism, Christianity, Scientology or Pastafarianism—without their speech being used to excuse violence as a response. Even racists, homophobes, nationalists, and sexists have this expectation of safety while they exercise their speech rights. In exchange for letting even bigots have free speech, we receive an indispensable return: those who have positive views which offend the mainstream are also protected. At one point it was “offensive” to the American mainstream to promote interracial marriage or equal rights for women, gays, and African Americans. If we didn’t protect unpopular speech, we would never have changed into a country which is proud of supporting these once “offensive” ideals, as any civic discourse aimed at shifting public opinion could simply have been met with violence (even these protections were imperfect, as the KKK demonstrated at the time). 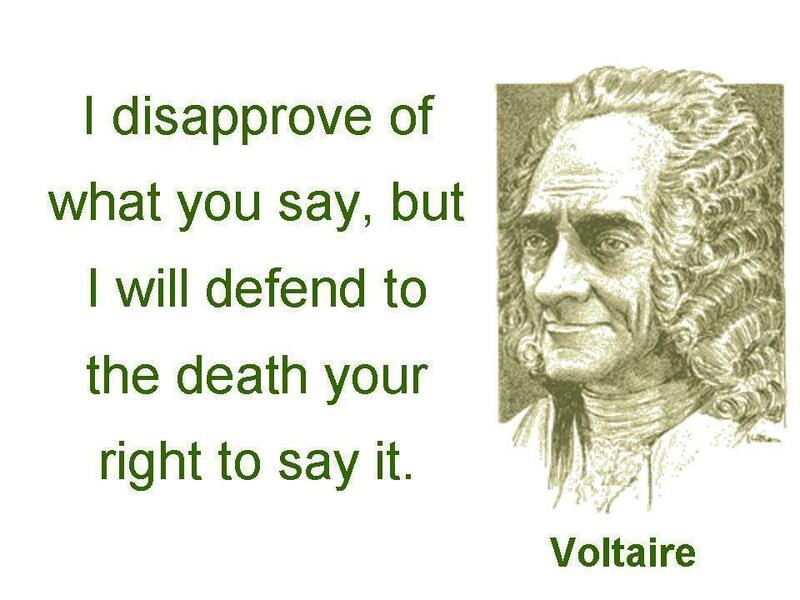 If somebody is offended by speech, they can ignore it, complain about it, counter it with arguments, boycott its sponsors, mock it with humor, or do any number of other things that do not involve violence. Unfortunately, many Muslims have yet to learn this and are currently stuck in much the same mentality that Christianity was stuck in during the dark ages—any blasphemy or thought-crime must be met with force so that god doesn’t get his feelings hurt. This thought process has no place in a free society and Muslims was work within their communities to implement the very same reforms that Christianity did (ex. separating religion/government, adopting religious protections, not taking insults to religious figures as seriously, etc.) while further marginalizing the extremists who give their religion a terrible name. I have tried as hard as I can to be non-biased about this story. I don’t think it’s humanly possible. were not extremists! They were just defending the ‘True Faith’ as Muhammad—PRAISE BE HIS NAME—demands. Tehran crowd that welcomed The Grand Ayatolla back to Iran after his exile. I never said a bigot is a person who tells the truth. Thank you Josh, for your sane and clear assessment.